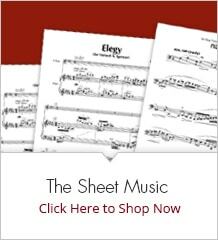 Meet some Note-ables | McGinty Music, LLC. 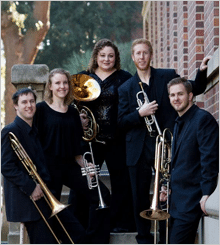 Vista Brass Quintet is a group of emerging young brass artists from all around the United States. After meeting at the University of Southern California, the group connected over a passion for new music, and the desire to bring exciting performance experiences to diverse audiences. During the winter months, VBQ embarked on a recording project that included revitalized interpretations of brass quintet standards and exploration of choral works set for brass. We were delighted to explore two of Anne’s pieces: God Rest Ye Merry Gentlemen and Schutz’s Die himmel erzählen die Ehre Gottes. Brass quintets are frequently called upon to provide holiday music, so it was a real treat to find an innovative and engaging setting of the classic carol. We found that God Rest Ye unfolded with natural energy that left us smiling and whistling. From our first read of the Schutz we were immediately drawn to the subtleties of phrasing and counterpoint. The writing in each of our parts translated effortlessly into a well-balanced choral effect reminiscent of old world cathedrals. Thanks so much for allowing us to explore these pieces, they provided an exciting diversion from the doldrums of recording, and jump started our programming ideas for the spring! Vanessa wrote: Greetings from Alaska! Land of the Midnight Sun, the Last Frontier! I moved to this gorgeous wonderland from the jungles of Manhattan twenty years ago this December. When I left the city my friends and family thought I was crazy. “What will you do? It’s so cold and dark there.” Followed by, “I always wanted to go to New York City!” Truth of the matter, I was done with city life. I wanted to fish, snowmachine, 4-wheel, and cross country ski out my back door. So Christmas day, 1992, I bought a one way ticket to Alaska. I took a bag of clothes, $200, and called my manager to tell him I was leaving not to return, which went over like a lead balloon; however, it was the best move of my life. I first came in contact with Anne McGinty three years ago, November 2009. The CEO of the company I worked for at the time heard I played flute (I stopped playing flute in 1975 to pick it up later in 2007) and asked if I would play for our company party in December. I took the challenge and said “Sure, I would love to!” As I walked out of his office panic struck me. Am I nuts? What did I just say? Am I trying to get a raise? Did I hear “yes” come out of my mouth? What am I going to play? Where am I going to get music? The anxiety of it all! At that moment I decided to find a few more flute players and play quartets. I needed partners in crime. So I started surfing the internet for music and found Anne. How lucky was I to stumble on to Anne McGinty and her Christmas repertoire. She saved me that Christmas. I found flute players and we were a big success at the party playing an entire set of only Anne’s collection of traditional carols arranged by Bill Reichenbach. Everyone really enjoyed the wonderful arrangements of each and every piece and the joyous sounds of the flutes. Ding Dong Merrily on High, I say! We enjoyed playing Anne’s Christmas repertoire so much we decided to stay together as a group and formed Fireweed Flutes. We have been a successful flute quartet in our community since that Christmas in 2009. We have a unique sound attributed to our collection of instruments from the full family of flutes. Group members play the bass flute, alto flute, traditional C flute and piccolo. 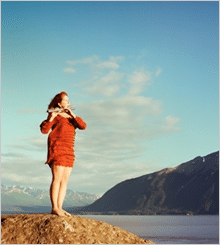 Our musical styles include contemporary arrangements of Celtic, Latin, jazz, folk, show tunes, African spirituals, patriotic, holiday pieces and more. It is that time of year again. The holidays are right around the corner. It is so easy. Just download, print, play! Our thanks to you, Anne. This will be the 3rd year that my group, the Conejo Slides, will be performing in the Simi Community Christmas event. We’ve had 8-13 trombone players participating, playing arrangements from Bill Reichenbach and some that I have written. Our tentative date is Saturday night, Dec. 8, 2012. I will get you more information as things firm up. Thanks again for your interest, and also for making Mr. Reichenbach’s fine arrangements available, with such easy access. We (the Glenwood Moravian Trombone Choir, Madison, WI) performed “O Little One” and “What Child Is This” at our two most recent Advent concerts. We are planning to perform “Echo Carol / Once in Royal David’s City” at our 2012 concert. The trombonists really enjoy playing Bill’s charts, and they sound great! I’ve admired Bill as a trombonist and composer/arranger for many years and appreciate you having some of his charts for sale.